Now that the site is becoming half famous, unfortunately it means that I have to be a little stricter on user comments as well as on my own posts. Comments are moderated. The good news is that generally there is no restriction on coarse language. What I don’t want are comments that will get me sued, since this is a non profit (income) blog. Be particularly careful on comments about people or commercial organisations. Architecture, design or public art, will generally have no restrictions of any type. Go crazy. Obviously racist comments cannot be used. Sexist has a little more leeway on a satirical site, but I as the comedian will have to be the final judge. Comments that disagree with posts or other comments are encouraged, and so far in 2000 plus comments, no-one has really been snarky or offensive in any way. I really want that to continue. Comments have a great vibe. 20% intelligent discussion and insight and 80% slagging off is a really nice balance. Generally I am looking for original material that you own or have permission to use. You can link to online material on the suggest page or in comments, but guest posts will generally be of original material unless exceptional or not already widely circulated. Photos should be of things that are visible to the public, unless you have permission to use them. Jumping of fences or invasions or privacy even if very good will regretfully have to be refused. (I have to heed this myself, and have had to delete a few of my overenthusiastic pictures). Keep up the good work, comments, pictures and suggestions. I love youse guys. By the way, I shall be visitint your site to see if you, the “moderator” dares or deems to publish my comments concerning your sad approach to tolerance of others’ simple happiness…. oh good, i look forward to seeing you again. Listen up Jean- Louis just because you Frenchies rolled over and handed the keys to Adolf on his European Holiday in 1942 without sounding a single shot, it doesnt mean that you can just post this trash anywhere on the www without taking some flak . Take your tolerance, simple happiness, numerous hot bread shops and GO HOME. This is Australia Mate. Get a real name like Shane or Bruce or Wayne….maybe even Neville. Crack a tinnie, abuse your missus, kick the dog, put on a Flannie and sing Working Class man wiht ya mates down the booza. I say, dear chap: Isn’t this a little hard on our French cousins? After all none of us took a stroll down the champs elyses in 1942. It must be said, however, that in a police state like WA it would be more useful to point out the obvious flaws that come with the universally observed three monkeys laws: see nothing, say nothing, hear nothing. And it really isn’tyonly the so-called conservatives who subscribe to authoritarian views. Escaped from Perth in 1993. Well Peter, what can I say. I was schooled with a strap right across my back right. But it’s all right now, know what I mean? I have to say that now The worst of Perth is the go to site for “body shaping” of the city, I suddenly find it appropiate to take on teh authotitarian views myself. To each according to their needs? Those cunts can play lacrosse on the foreshore. No seriously they can. Peter – escaped to where????? If you are still in Australia and we are talking about moderation on websites, what about Conroy’s proposed censorship? We cannot afford to ignore this! personal information should be not allowed on this site. How is a licence plate personal? Unless it’s personalised, I guess. 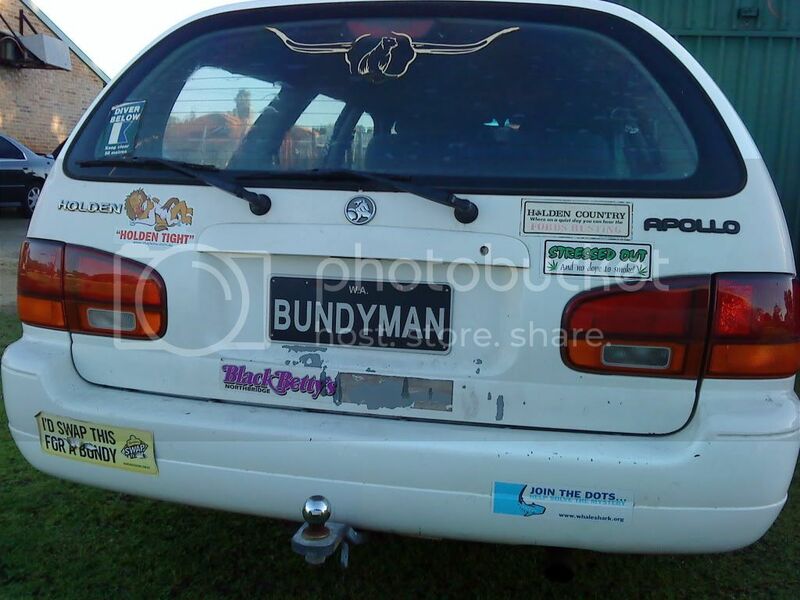 Is it still OK if I ridicule Bundyman and Suzie? Mr Coco has got nervies due to u. But what if she did? 5 minutes of fame and all that. Who wrote this artical and Lesly Dewar are you Scottish? i have just read your policy and believe that you did not and do not have permission from the owners of the willagee house with the manniquin in it, to publish that photo. So would be appreciated if you would kindly remove it from this site asap !!! No permission required. It is in public view. Deliberately so. Celebrate it, don’t censor it. I believe that there have been several significant improvements in mental health service delivery recently. I’ve been lurking and watching this site the way a camouflaged cuttlefish hunts and sneaks under the froth and spume of Gage Roads, watching with it’s glassy cephalopod eyes as a juicy banana prawn drifts into striking distance. Phwoar. So you’ve realised bento and skink are the alpha wankers of TWOP? We seem to be sexualising prawns quite a bit this week. Is it the lead-up to Christmas, perhaps? Hang on: don’t come the…oh. Something of a damp squid, that one. Ah ha! Excellent slagging off, my good man. Good lord, my reply slotted under my own comment. How humiliating.